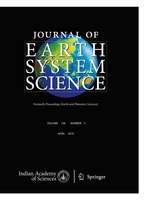 The paper discusses on the variations of the atmospheric vertical electric field measured at sub-auroral station Maitri (70°75′S, 11°75′E), and polar station Vostok (78.5°S, 107°E) during the geomagnetic disturbances on 25–26 January 2006. Diurnal variation of surface electric field measured at Maitri shows a similar variation with worldwide thunderstorm activity, whereas the departure of the field is observed during disturbed periods. This part of the field corresponds to the magnetospheric/ionospheric (an additional generator in the polar regions) voltage generators. Solar wind parameters and planetary indices represent the temporal variation of the disturbances, and digital fluxgate magnetometer variation continuously monitored to trace the auroral movement at Maitri. We have observed that the electrojet movement leaves its signature on vertical and horizontal components of the DFM in addition; the study infers the position of auroral current wedge with respect to Maitri. To exhibit the auroral oval, OVATION model is obtained with the aid of DMSP satellite and UV measurements. It is noted that the Maitri is almost within the auroral oval during the periods of disturbances. To examine the simultaneous changes in the vertical electric field associated with this magnetic disturbance, the dawn–dusk potential is studied for every UT hours; the potential was obtained from Weimer model and SuperDARN radar. The comparison reveals the plausible situation for the superposition of dawn–dusk potential on surface electric field over Maitri. This observation also shows that the superposition may not be consistent with the phase of the electrojet. Comparison of surface electric field at Maitri and Vostok shows that the parallel variation exhibits with each other, but during the period of geomagnetic disturbances, the influence is not much discerned at Vostok.